It’s a reversal of the old fallacy, “spend more and you’ll save more.” When it comes to household energy use, we’re saving more and then using our savings to buy more stuff. 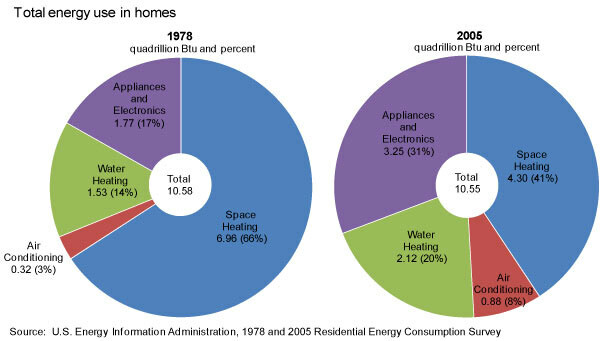 At least that’s one way to interpret the latest figures from the Energy Information Administration’s Residential Energy Consumption Survey. In 1978, personal computers were expensive and not typically used by US households. In 2009, 76 percent of US homes had at least one computer, eight percentage points more than just four years prior, and 35 percent had multiple computers. DVD players and Digital Video Recorders (DVRs), which did not exist 15 years ago, are now widespread. As of 2009, 79 percent of homes had a DVD player, and 43 percent had a DVR. 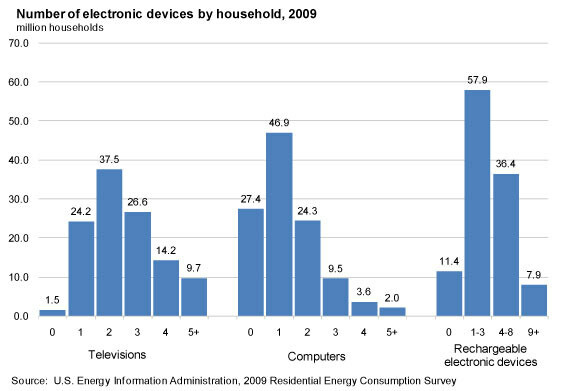 Nearly a third of all households also had at least four electronic devices, such as cell phones, plugged in and charging at home. Hey, I want five-plus televisions, too! (One for the cat!) Now children, don’t forget to tweet this item from your smartphones as you stream The Social Network via your Wii consoles to your personal Sony wide-screens.